Download the report summary or download the full report. The 150 women artisans in Masoro are employees of Abahizi Dushygikirane Corporation or ADC, the supplier of Kate Spade & Company’s on purpose label. 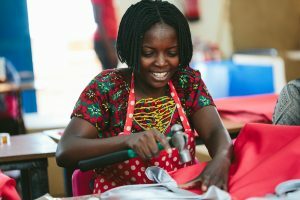 ADC is Rwanda’s premiere handbag manufacturing partner providing high-quality products to the global fashion industry with a social commitment to empower its employees and transform its community. Learn more about Georgetown’s involvement in the project here and the latest press release from Georgetown here. For press inquiries, please contact Molly Fleenor at 202-687-5254 or molly.fleenor@georgetown.edu. Artisans also claim to have higher levels of physical health, social standing, power, and confidence; and lower levels of anxiety. While it is premature to draw any significant conclusions regarding ADC’s long-term financial sustainability, the study concludes that ADC has the rudimentary elements of a sustainable business and has a realistic prospect of achieving its commercial purpose, which is to prosper as a supplier to multiple fashion brands. June 19-21, 2018. Welcome Semi-Finalists to the WomenConnect Solver Symposium: a global call for solutions to improve women’s participation in everyday life by meaningfully changing the ways women and girls access and use technology. At the Georgetown University Women’s Leadership Institute (GUWLI), we generate scientific insight to empower real-world impact. We offer programs to develop principled leaders and partner with companies to create gender-neutral environments where all employees can thrive. The GUWLI Team and Affiliated Faculty invite you to get involved in our work. Join the conversation on Facebook and Twitter. Learn new strategies. Share your experiences. Together, we can help transform scientific insight into meaningful impact to create a better, more inclusive workforce. Copyright © 2019 Georgetown Women’s Leadership Institute All Rights Reserved.